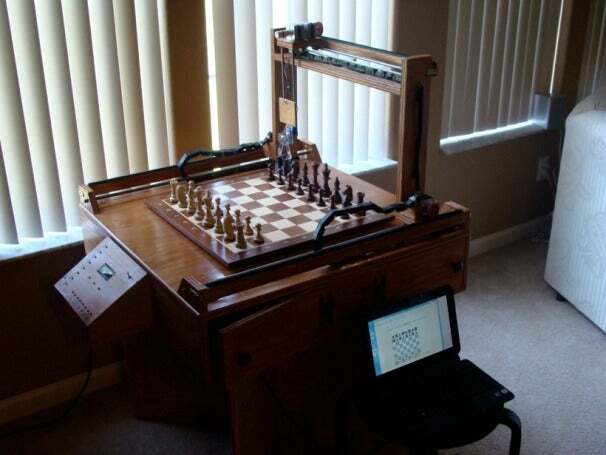 Playing chess with a computer program is often the best way to challenge yourself as a player when you don’t have a partner to play with. Unfortunately, playing chess on the screen isn’t the same experience as playing it with physical pieces. Patrick McCabe is trying to couple the physicality of a real chess board with the utility of a chess computer. To do so, he created a CNC plotter with a grabber to move pieces around the board. It’s powered by software called MyRobotLab, an open-source framework for making robots work based on Java services. Human control for the chess game takes place at a console on one side of the board. There, the player selects the piece to move, and the robot moves it.The computer then tells the robot to move after a pause to figure out its next move. When a piece is captured, the robot helpfully removes it from play and drops it in front of the human player. The computer plays, and the game continues until either black or white wins. For those of you interested in building a similar ‘bot, McCabe has a detailed write-up available for your perusal. Blair Hanley Frank tends to open with the Ruy Lopez when playing White.